California received mixed results on this week’s release of national test scores known as the “nation’s report card,” showing modest gains compared to generally static national results. On the positive side, California showed some improvement in eighth- and fourth-grade reading on the National Assessment of Educational Progress test. However, wide achievement gaps remain and the state’s performance among low-income students (those eligible for the National School Lunch Program) and Hispanic students, in particular, show that there is much more work to be done. The exams are given every two years in reading, writing and math and provide a snapshot of academic achievement across the 50 states, the District of Columbia, Puerto Rico, and 27 urban school districts. 2017 was the first year the test was given on computer tablets, which some say contributed to the stagnant scores. For reading, California fourth-graders were just below the national average, with a 215 average score (out of 500), compared to 221 nationally. Thirty-one percent of these California students scored at or above proficient, compared to 37 percent nationally. Among eighth-graders, California showed progress in reading, moving to within two points of the national average with a 263 average result after being 10 points below average 10 years ago. Thirty-two percent scored at or above proficient, compared to 36 percent nationally. Similar to the national results, the state’s math results showed little overall progress. For fourth-graders, when compared to a score of 239 for the national average, California scored among the bottom 10 states, with a score of 232. Thirty-one percent of California fourth-graders were considered at or above proficient, compared to 40 percent nationally. Compared to the national average of 282, California eighth-graders scored 277, with 29 percent at or above proficient, compared to 34 percent nationally. Among the urban districts, Los Angeles, Fresno and San Diego all showed slight gains in reading, with the San Diego Unified School District moving up six points for fourth-grade reading and scoring above the national average for the first time. Low-income students (those eligible for the National School Lunch Program) in all tests. In fact, California ranks last in fourth-grade math for this student population. Moreover, California continues to have among the widest achievement gaps for some student groups. 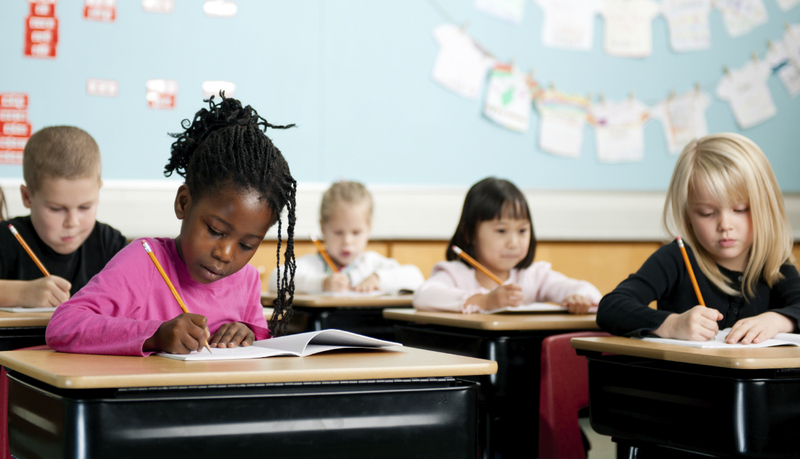 For example, in fourth-grade reading, there is a 27-percentage point gap between the proportion of Hispanic students that are proficient or advanced, compared to white students; a 31-percentage point gap between African-American and white students (5 points wider than in 2007); and a 34-percentage point gap between low-income students and their wealthier peers.